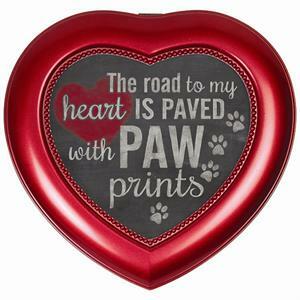 as a keepsake urn for any size pet when only a small amount of ashes are kept. A heart shaped hinged cover makes for easy access. 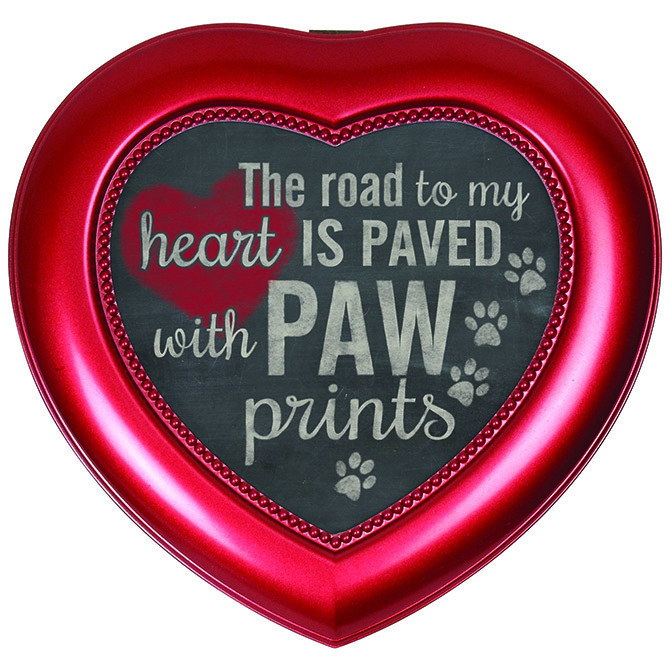 Around the center beaded area of the cover is a removable sentiment card that reads: "The road to my heart is paved with paw prints". This may be replaced by a personal photo if desired. The inside of the cover is velvet lined with 2 1/2" x 2" photo area made available for a favorite photo. The base of the urn is also lined in black velvet with two compartments. The upper compartment holds the concealed workings of the music box although a small tag could be placed in this area. Ashes would be placed in the bottom compartment. A hand crank music mechanism can be found on the bottom of the urn which plays "Carousel Waltz" when the cover is opened.